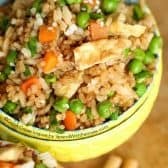 Homemade Fried Rice is easy to make at home and loaded with flavor. Add leftover veggies and proteins to make the perfect meal! Heat oil in a wok or nonstick pan over medium-high heat. Add in garlic, ginger and the white portion of the green onions. Cook until fragrant. Add carrots & peas, cook until heated and softened. Add rice (and protein if using) continue to cook until rice slightly crisped and brown. Don’t stir too much, you do want to get a little bit of caramelization. Add in cooked egg, soy sauce & sesame oil. Garnish with remaining green onion and sesame seeds if desired.